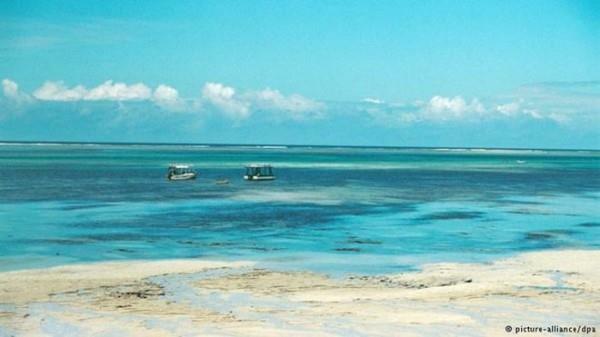 A narrow triangle off the coast of Africa, in the Indian Ocean, about 100,000 square kilometers (62,000 square miles), is the bone of contention between neighboring Kenya and Somalia. Both countries want the area because it supposedly has a large deposit of oil and gas, but it's not clear to which country it belongs. "The position of the boundary is a gray area," said Timothy Walter, a maritime border conflict researcher at the Institute for Security Studies (ISS) in South Africa. That does not seem to have worked - at least from the Somali perspective. In 2014, Somalia sued Kenya at the International Court of Justice (ICJ) in The Hague. The court represents one way of solving border conflicts in maritime areas if bilateral or regional attempts fail. Kenya's government, however, is sticking to its preferred border demarcation. For nearly 100 years, it had considered this line to be its border, the government wrote. If court proceedings are opened, then the decision on the border will be binding. Walker thinks that a court case is a high risk for both states. "If the court should decide in favor of Somalia, the Kenyan border would shift dramatically," he said. This could lead to a dispute over the maritime boundary with Kenya's southern neighbor Tanzania, which could in turn have an impact on Mozambique, Madagascar and South Africa. A compromise is possible, of course, at least in theory: "Both countries could share the area and the mining of raw materials," Walker said. He said there is a good example in West Africa, where Nigeria and the archipelago of Sao Tome and Principe teamed up to produce oil. But for Somalia and Kenya, Walker does not see any chance. "Both countries do not want to make any compromise when it comes to their own sovereign rights. That can change, of course, but at the moment, it looks like an either-or decision," he said. Walker estimates that the decision will be made next year. Overall, experts like Walker are observing a growing trend for states, especially in Africa, to take an interest in setting their maritime borders. Walker calls it the "end of the sea-blindness." "Most African states lack a substantial navy or a coastguard and many conflicts have spilled over land boundaries or land borders. So historically, there has always been a focus on what is happening on land. Now, that's changing because what we can see more and more is the resources from the sea are more accessible now through better technological processes," Walker said.